When it comes to buying a mid-size SUV, there are a lot of options out there for you on the market. That’s why you have do your research. 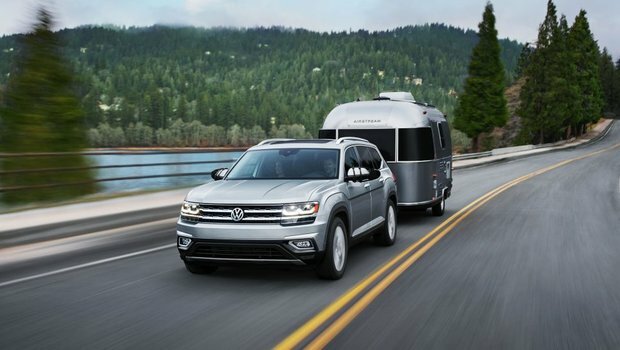 When it comes to the 2018 Volkswagen Atlas, the model stands out by offering customers the very best tech and safety equipment, and one of the most spacious cabins in the industry. No wonder the 2018 Volkswagen Atlas reviews are so positive. Let’s have a look. Like its namesake, the Volkswagen Atlas can carry the world on its shoulders—figuratively speaking. Two adults fit comfortably in the third row with room for luggage behind them. Apple CarPlay and Android Auto are standard; 12-speaker Fender audio is optional. The base model comes with a 235-hp turbo four, front-wheel drive, and an eight-speed automatic. All-wheel drive is available if you choose the 276-hp V-6. Optional safety tech includes automated emergency braking and lane-keeping assist. Second, there’s little getting used to the Atlas driving experience, if this will be your first great big brute of a ute. Don’t worry about its heft: though there’s a lot of vehicle surrounding you, and though you sit up high with a commanding forward view, Atlas is light at its controls, feels easily maneuverable as big utes go, and is scarcely harder to position, park, or weave around obstacles than a small car. The bricky look to the styling suggests that Atlas drives like a tank, but around town, and while parking especially, this is not the case. Hit the highway, and some of the lightness at the controls is traded for a weightier feel. The steering heavies up a measure, and the Atlas’s weight feels more apparent when cruising. Mostly, this helps the machine stay locked into its lane with minimal need to readjust, while imparting that weighty utility vehicle feeling that many appreciate. Still, Atlas manages to avoid feeling clumsy, gigantic, or ponderous when driven the way most will drive it, most of the time. It’s a beefy cruiser, but it doesn’t feel like you’re driving a burrito truck, or like the suspension is made of coagulated gravy. Inside, the story is all about space. The middle row seating is comfortable with enough space for three taller adults to sit comfortably — the third row not so much. Now given the choice of riding back there or walking home in the rain … well, I’m staying dry. Then there’s the flexibility and space for seven and cargo. With all seats occupied, there’s 583 litres, dropping the third row opens up to 1,571 and with the lot flat there’s 2,741 litres. That, by any measure, is roomy. 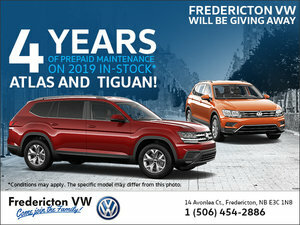 Contact us today at Fredericton Volkswagen to learn more!